This is our last GT project EVER, then we go to high school! I've been working on this blog for three years now and time flies. It feels like yesterday was the first day of middle school. We are making music videos and my teammates are Alina, Ashley, and Jhoanna. The song we decided to do You Make My Dreams Come True by Hall and Oates. 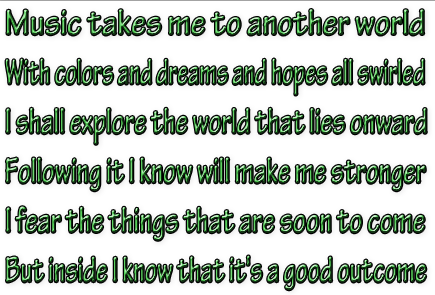 We all thought that the song had a catchy tune and that we could create a storyline out of it. We also didn't really want to do a modern song and decided to do something a little older. We are only doing the first two minutes of the song, so we assigned each person a verse to do their lip synch and storyline to. Each person has a different reason to be stressed and uses food to help cope with it. Then we all meet at a food event and become best food friends. For Jhoanna's part, one of the lyrics are "like the flame that burns the candle, the candle feeds the flame" so we made it about Jhoanna being afraid of the dark. Ashley's story is about being stressed with piles of homework because the lyrics are "what I've got's full stock." Alina's story is about having nightmares and mine is about sneaking food at night. Then we all see flyers for a food festival and meet up together. We really tried to show our best work in this music video. It is our last project so we wanted to make it our best. We made sure to add in as many composition techniques that we could, and we tried to make everything in sequences. 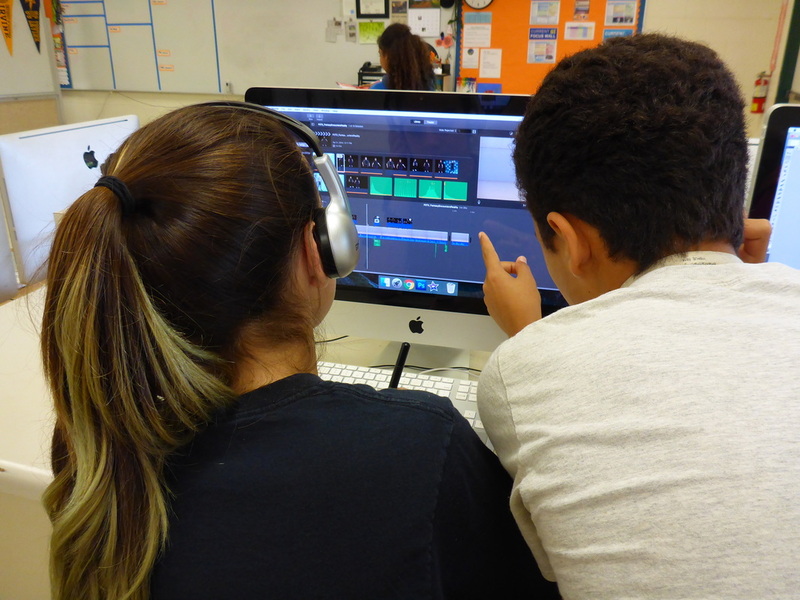 While editing we cut everything to the beat and added appropriate effects to fit the storyline. I feel like this is the best music video we've made during these 3 years in GT! I'm so excited to finally go to the high school! Especially since our GT teacher Mr. Sanderl is coming with us! Hey y'all! Right now in GT we are doing movie trailers. We have to make a movie trailer with a dramatic voice over (performed by me) and a cliffhanger. Our video has to be 90 to 120 seconds. We also have to include a movie poster made in PhotoShop. 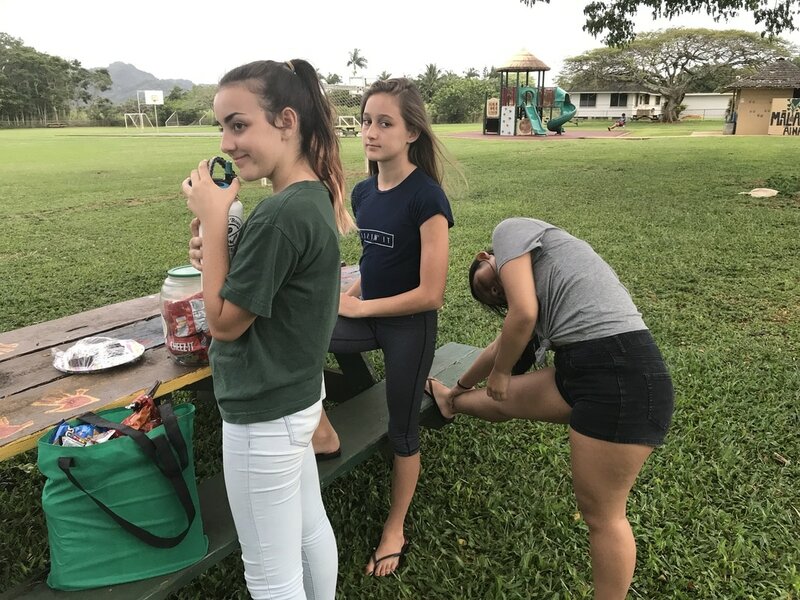 My movie trailer team is Ella, Cara, Denae, and I. Denae and Cara worked mostly on the design of our movie poster and characters. Ella helped the most with writing the script and synopsis. 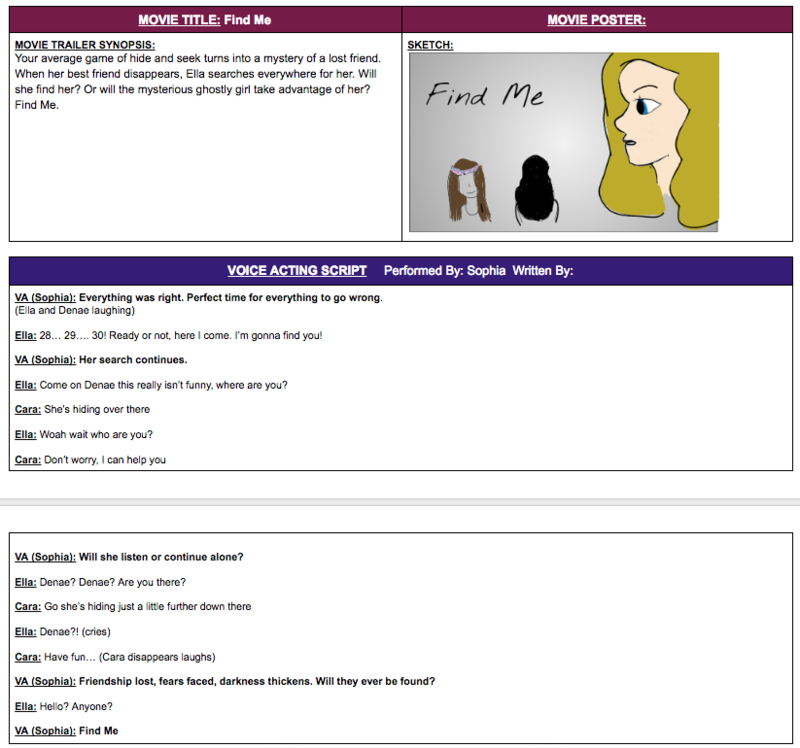 I worked on the voice acting script and the main plot of the story. One of our biggest challenges was filming. 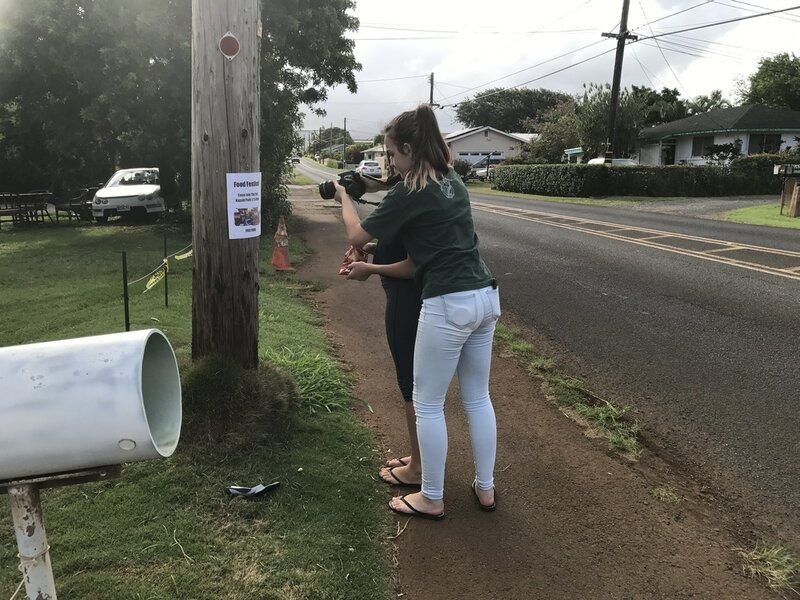 We thought a good filming spot would be at Ella's house, which is an hour away from where everyone else on the team lived. For Denae, Cara and I, we all had to find someone who could drive us there and back. It was a little challenging to find a ride because a lot of our parents didn't want to drive so far. 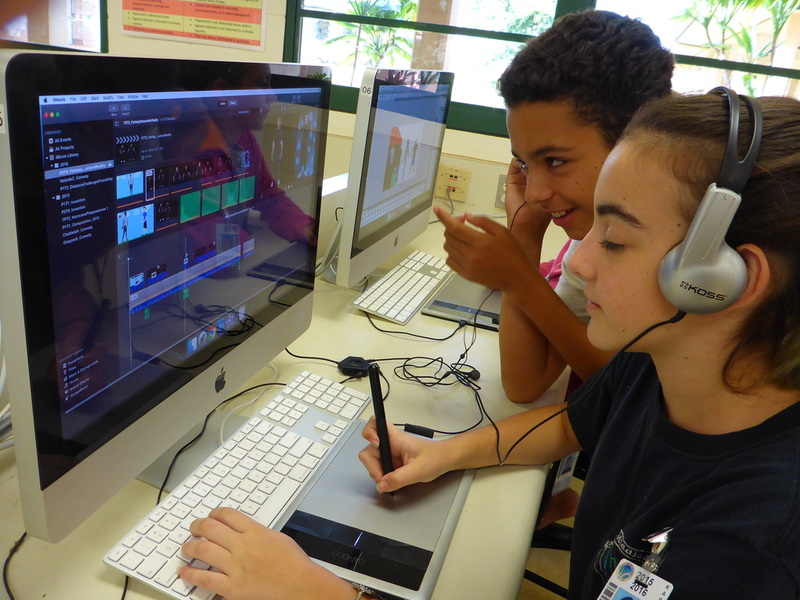 One of our successes was with editing. Since we got all of our film in one day, we were able to edit a lot in one day. We filmed nearly everything in order so it was easy to find our clips and put them in order. We didn't have many disagreements and worked well as a team. I think we did pretty well during the critique. We met all the expectations, and everyone from the class either said that we met all expectations or that we went above and beyond. We didn't get voted for best trailer but I think we still did a good job and that people enjoyed watching it. I feel like with this movie trailer project I definitely learned how to work with new people. Hello everyone! Right now in GT we are doing​animation and my teammates are Jhoanna and Steven. Our project goal is to focus on metamorphosis, so our characters are going to transform and change into different things. A simple example would be a mouse becoming a lion. 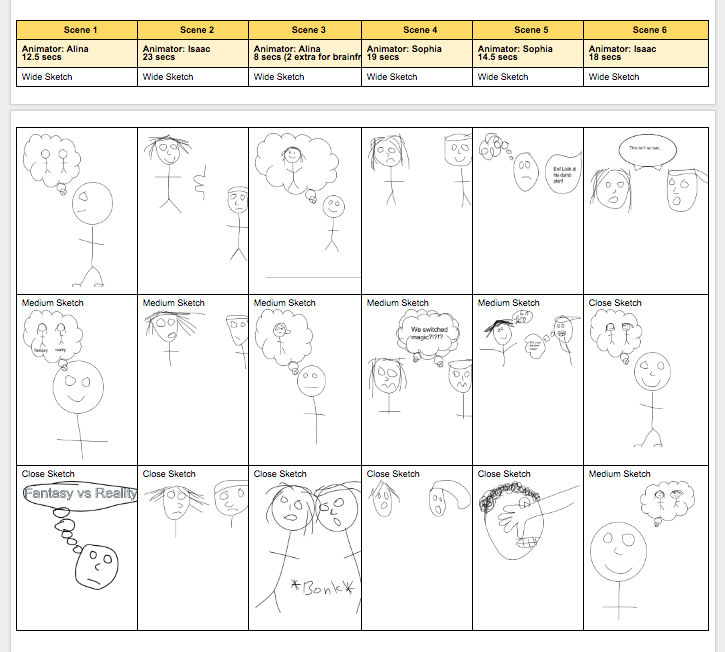 We pitched our two best ideas to the class and then we got started on our storyboard and then started animating! Every time something morphs into a new thing, we change the animation type. 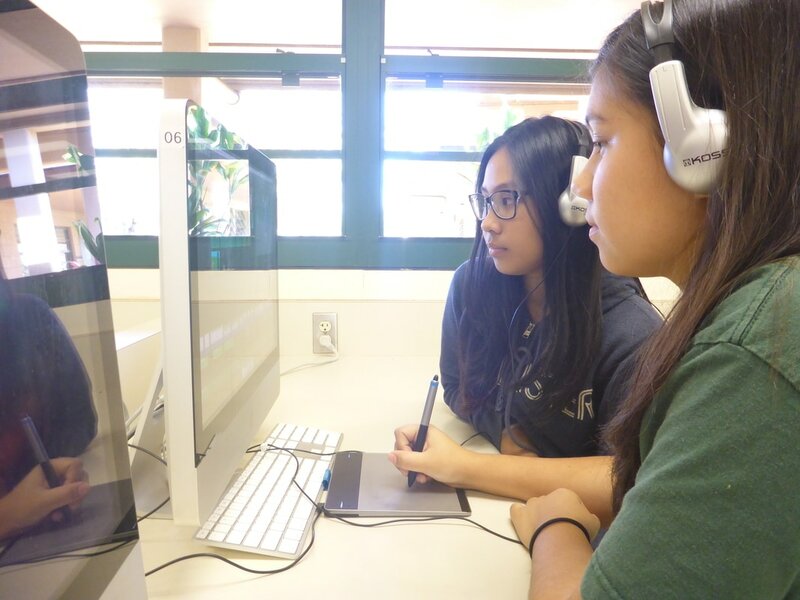 We plan to use stop-motion, PhotoShop, and whiteboard. 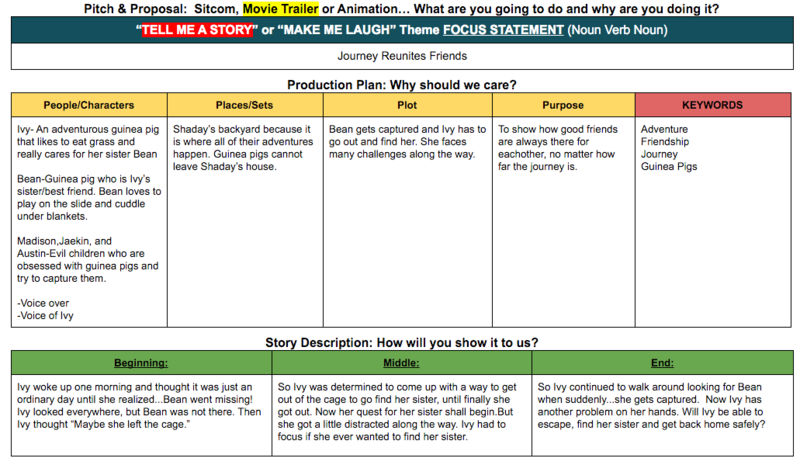 Our focus statement is "Jhoanna Cains Courage" and our plan was that Jhoanna is shy and has trouble making friends. She wants to walk up and say hello to people at the park but is too nervous and just goes home. On her way home a lion appears and says that he can teach her courage. He turns Jhoanna into a lion and says she has courage. Then he gives her a test and turns Jhoanna into a mouse. Jhoanna thinks that she lost the courage, but really she had it all along. She gets turned back into herself and is able to go up and make friends. During the critique we did pretty well. Everything was graded at around 3/4, which is a little better than I expected. We barely finished on time so I am happy we got it completed. I agree with the results because not everything was perfect, but we met most of the requirements. 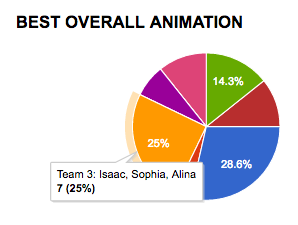 Although we didn't get voted for best animation, I think the winners deserved it. Hello again! 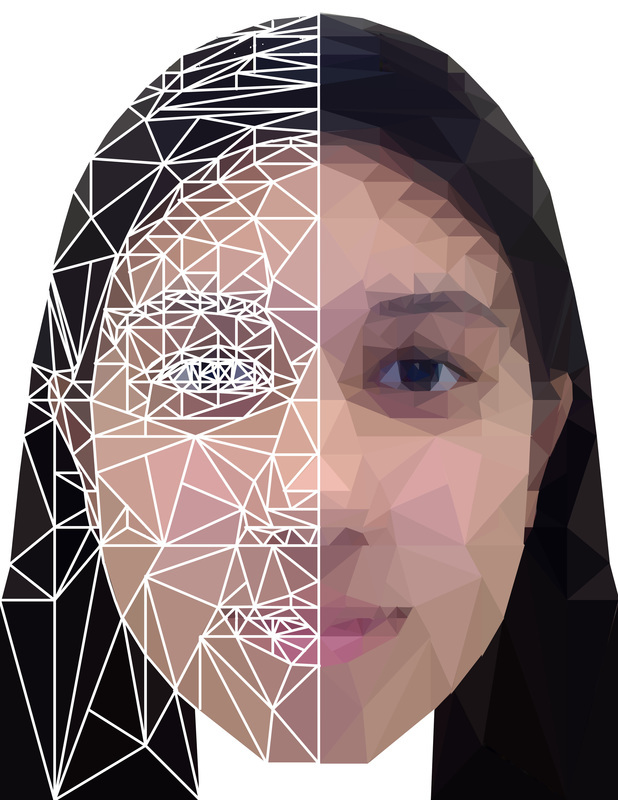 Right now in GT we are doing low poly portraits, and it has a lot to do with facial expressions (because it is of our faces). I think that facial expressions can be really universal. There isn't a language barrier between people, for example if you see someone smiling most people would think that they are happy. Expressions are a language that could be understood by anyone. Sometimes it is harder to read or understand a person's expression because they don't use expressions, but most of the time you have a good idea of what they are thinking by the look on their face. 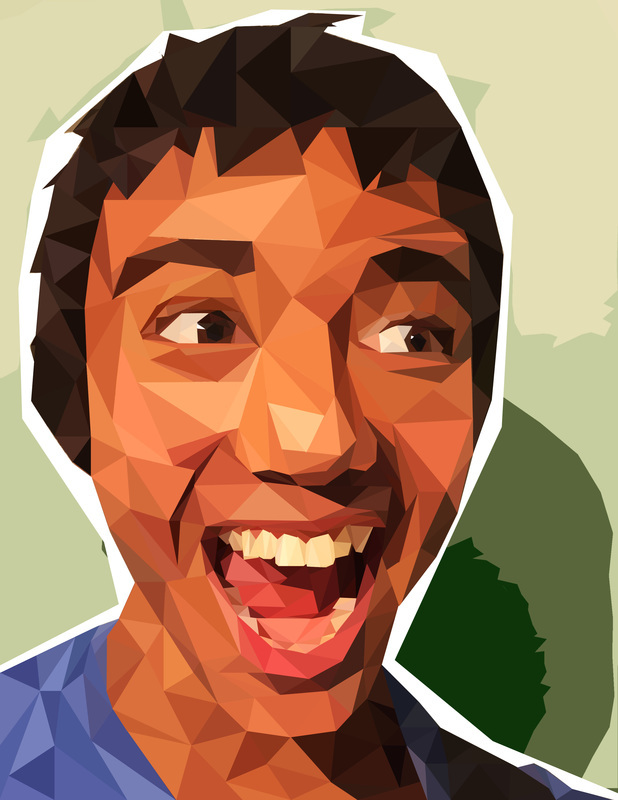 Creating low poly portraits are fairly simple. The main reason it takes a long time is because we keep repeating steps and it's just a long process to go through. First you take a portrait of someone . If your portrait is symmetrical then you only have to do one half of it, and afterwards you can copy and flip it to the other side. With the line tool, you trace the outline of your head in a bright color (like red). Make sure you have the grid on and try to make all of your lines start and end on a line in the grid. Then you start making triangles. 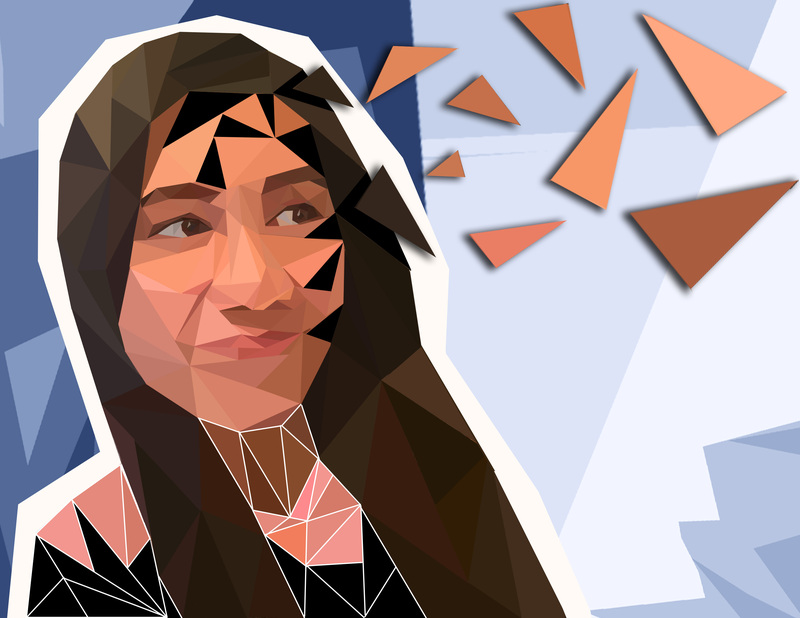 Note that more detailed parts of your face should probably have smaller triangles (eyes, nose, mouth), and the bigger areas should have bigger triangles (skin and hair). Once everything is in triangles, you use the polygonal lasso tool. 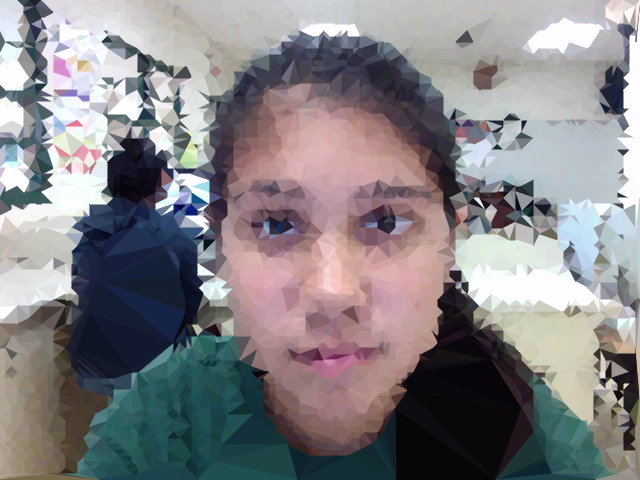 You select a triangle and go Filter-Blur-Average to change the triangle to a solid color. You do that for every triangle. Afterwards you flip the half and you have the full face! My Poly-1 and Poly-2 image are very different. My first poly is very flat, I personally think it looks like a cyborg. 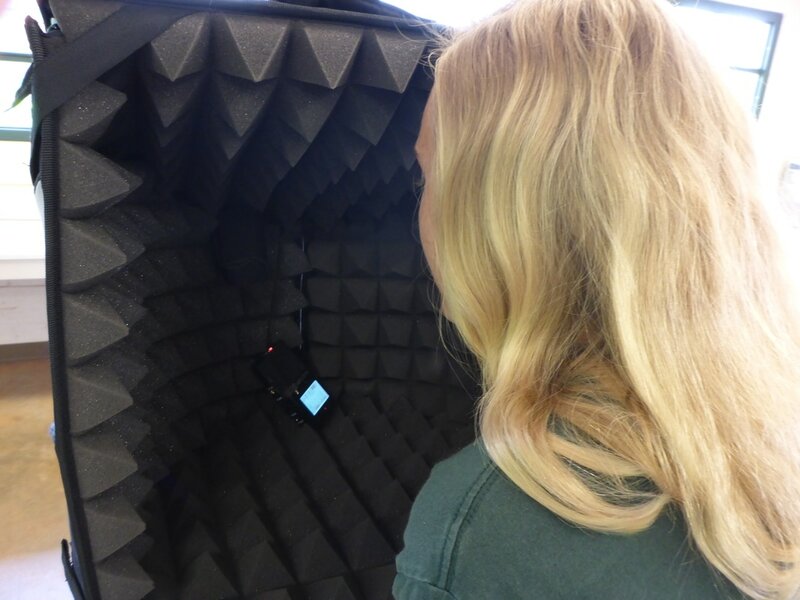 The second poly is a little more artistic and creative. 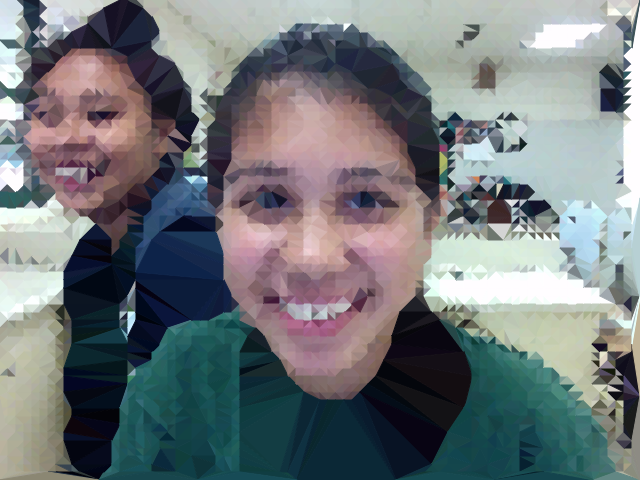 With the second poly, we didn't have to outline and we just got straight to making triangles and filling them in. We also got to pick the color we wanted so it got to be more creative and some parts of the image get to stand out more. Although with outlining, it is definitely a safer route because you can outline every feature and change it if you want to. The second poly went a little faster and you got to be more creative about where the triangles went and what color they are. One thing to be aware of was not making gaps and making appropriately sized triangles. Hello people! In GT we are starting a brand new project with the continuing theme about nature. 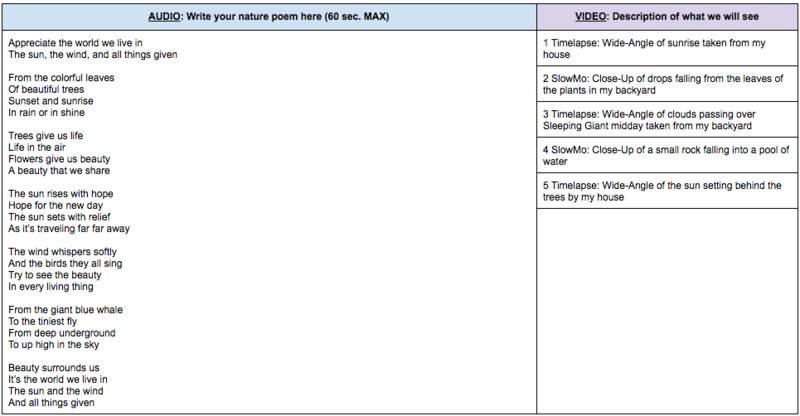 We are making a video project using poetry, timelapses, and slow-mos. The audio will be us reciting our poem (with music in the background), and the visuals are of different timelapses and slow-mos of nature. Nature impacts our lives in many ways. We interact with it everyday. From the basic things like breathing and eating, to activities like going to the beach or hiking. I really had to think about these things while trying to write my poem. I had some trouble with thinking about it at first but once I started going, all the ideas kept flooding into my head. To create a timelapse, you have to place your camera in one spot and take a video for a certain amount of time. 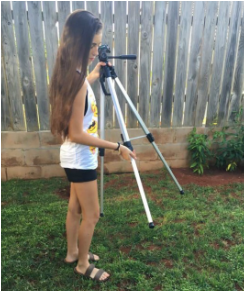 Make sure to use some kind of tripod (a real tripod or environmental tripod) so the camera doesn't move. Once you have your video you speed it up to show time passing. The shot should be two-thirds sky so you can notice the clouds moving or the sun moving across the sky. To create a slowmo, you get a close up shot of something moving and slow it down. For example, if you took a video of water dripping off plants. It is also important to not have any camera movement so it can focus on the subject. 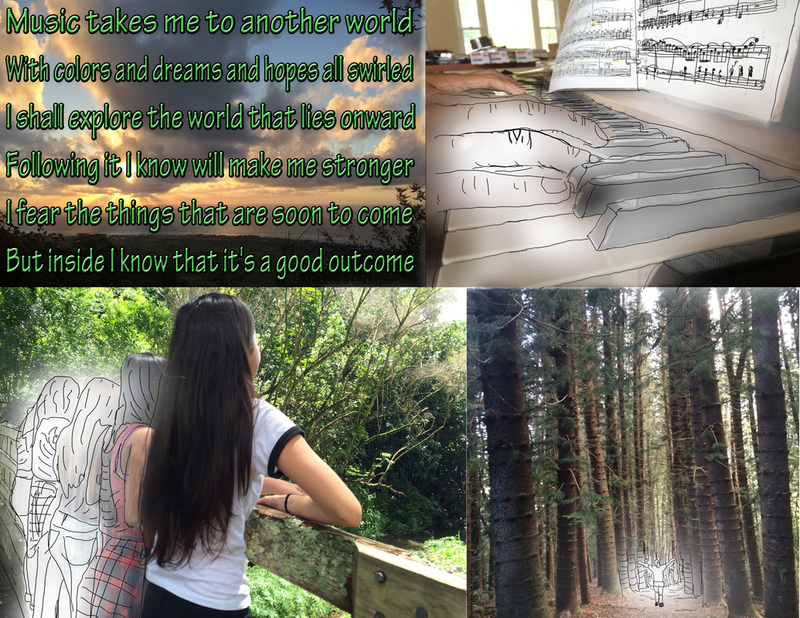 The hardest part of the project was definitely writing my poem. I had trouble with starting it off, I didn't know if I should talk about just a specific part of nature, or if I should talk about nature in general. I wanted my poem to rhyme and I couldn't think of rhyming words. But once I got started and wrote my first stanza, the rest seemed to come a little more naturally and quicker. My favorite part was definitely when I got to work in Final Cut Pro. I think that it's really cool when I took a regular video and once I go into Final Cut I get to finally see what it looks like when it's all slowed down or sped up. 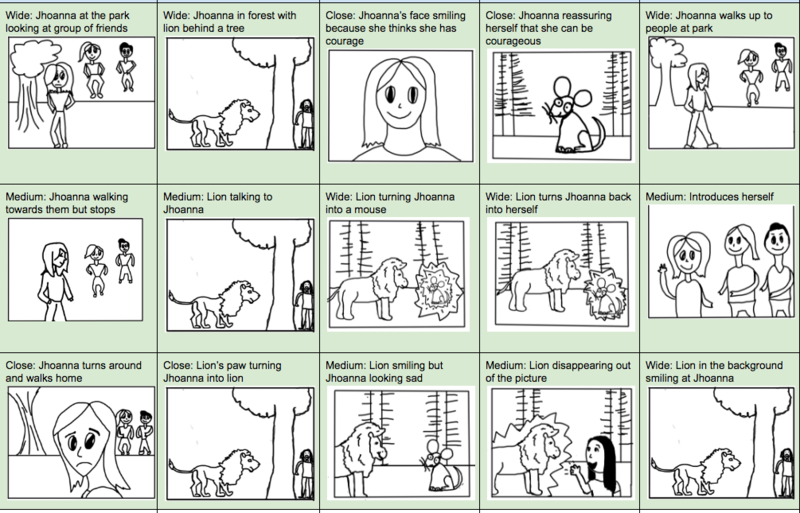 I like how the visuals for the project are actually pretty simple, we didn't have to do any kind of sequencing. It was just timelapses and slow-mos which I really enjoyed making. I was very happy with the results from the critique. I thought I deserved a 4/4, and that's what most of the class thought also. I got a couple of 3/4 grades from some people, and I could see why they'd think that. My audio seemed a little softer than others, but other than that I think my visuals were very good, and they might even make up for the audio. ​Guess who's backkkkk!!!!!! So to start off the new school year, we are doing poetry and personal goals. I think that poetry is expressing feelings, emotions, and ideas. Poetry is usually very expressive and meaningful. Poetry can paint pictures in your mind. It is a very emotional, imaginative, and inspiring style of expression. It sometimes teaches a lesson or it's just shows your thoughts. In my personal statement I tried to used rhythm and rhyme. I think that when you use rhythm and rhyme it helps to make everything flow and make sense. I honestly love it when things rhyme. It helps me remember things and helps the key words stay in your brain. Rhythm helps when you read something so it doesn't confuse you as much. I feel like using rhythm and rhyme also helps when you're reading to transition to the next line. Hello! This is my last blog post for the 2015-2016 school year! The next time you hear from me, I will be an 8th grader! So our last project of the year is the music video project. My teammates are Shaday, Kyllie, and Kiana. The song we decided to do is Hello by Adele (we used the first 2 minutes of the song). The story we wanted to have with our song is that there was a group of friends (me, Shaday, Kyllie and Kiana), but one day we get in a fight and split up into 2 groups (me and Kyllie, and Shaday and Kiana). Kyllie and I keep calling Shaday and Kiana to tell them we're sorry, but they keep ignoring our calls. In the end, they finally answer and we all become friends again. Our story relates to our lyrics because the lyrics say things like "I've been wondering if after all these years you'd like to meet." This matches with when Kyllie and I are trying to talk to Shaday and Kiana because we want to meet up. The lyrics in the song have a lot to do with reconnecting with people from your past, so we tried to our story about that. In our music video we have a couple of fast-edit montage sequences. My favorite one is when you hear the lyrics, "I must've called a thousand times." During this part you see me and Kyllie trying to call Shaday and Kiana over and over again. We move to different parts of the yard, each time wearing a different shirt so it looks like it was over the course of many days. We filmed this by putting the camera down in one spot and pressing record. Then Kyllie and I sat on one part of the grass and held the phone up to our ear. After about 2 seconds, we got up, changed, and sat back down on a different part of the grass. We did this 8 times and let the camera roll through the whole thing so it wouldn't be shaky. We cut out the parts when we get up so it looks like we flash to different parts of the yard. This music video showcases our best work because we tried really hard on this. We tried to use all the things we've learned this year (sequencing, composition techniques, etc.) and add them into our video. I also think that we planned it very well. When editing in iMovie we looked at the plan to see where we have to place each shot. 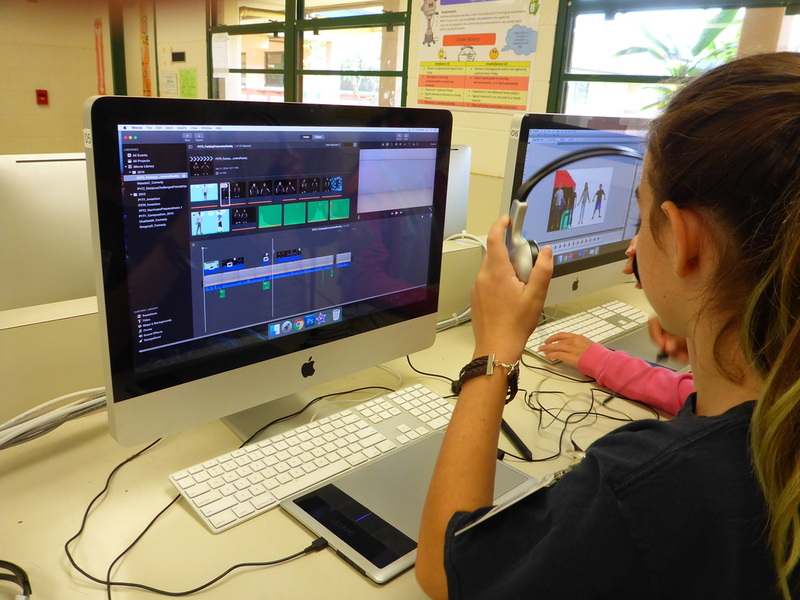 Another thing we did in iMovie was add different effects to all of our shots. We only filmed on one day, but in that day we were able to get everything we needed. We even changed clothes so it looked like it was on different days. My team is with my friends, so we work well together and have lots of similar ideas. It's our last project of the year, and we wanted to make it the best one yet. Hello! So right now we are doing an animation project. My teammates are Isaac and Alina. Isaacs character traits are that he is clumsy and indecisive. We are going to exaggerate these traits in our animation by making Isaac a kid who has 2 emotions in his head (Alina and I), and he can't pick between us. Alina is a big perfectionist. She wants everything to be neat and organized. I am a procrastinator and I don't really care about what other people think. I'm messy and very unorganized. In our animation, Alina and I are opposites and we need to work together to solve problems. One of the requirements is to add humor into our animation. The way we did this was by really exaggerating our character traits to a point where it is somewhat funny. We also tried to add in some humorous dialogue. Our animation has a couple of life lessons. One of them is that you don't have to be perfect. Another one​ is that you have to work together to solve your problems. I think that a lot of people can relate to this because many people don't like the people they work with, but sometimes you just have to deal with it. When picking teams, we had to work with new people that we have never worked with before. I think that we work together great. We all shared our ideas and opinions, and tried to combine everyone's ideas into our animation. I feel like we started to get more productive as the deadline started to get closer and closer. We got a little more familiar with puppet warp towards the end of the project and were able to animate a little faster. I think our biggest challenge was that sometimes not all of us were here. I was absent a couple of days and so was Isaac. Another challenge was that other GT kids from other periods use the same computer as you, so if you wanted to work on it during recess you really had to fight for your spot. I think our best moments were putting our animations together in iMovie because it was pretty cool seeing it match with the voice overs. Something that looks like just random people moving their arms and legs has now becoming an entire story. When animating myself, I plan to exaggerate some of my character traits. One thing is that I always like to correct people. I think I could animate this so that when someone messes up I will try to correct them. Another character trait that I have is that I am always really lazy and do not want to do anything. I am also a big procrastinator. I try to get things done but I get so distracted sometimes. The first step of creating our .GIF animated character is to take a picture of the front, back and side of you. Then you go into photoshop and used the quick selection tool to cut yourself out. Once you are done with that, you can open the animation window and start animating yourself. You make multiple slides and move the character a little bit for every slide. When it is played back, it looks like it is moving. We also used and added puppet warp to our .gifs so it looks like specific parts of our bodies are moving. Kacie, and Kiana. We are planning on making a sequel to lasts years movie trailer, "Snoopy George" which was a lot of fun making. I think my keywords (adventure, friendship, journey, guinea pigs) can really connect with our audience. A lot of people like adventures and journeys, they are lots of fun. I also think that friendship is important to a lot of people. An adventure by yourself is fun, but one with you friends can be even better. We really wanted people to realize these things and encourage them to go out and make life interesting. Do what you love to do. ​The overall message of our video was to show that Ivy (main character), really cares about her friend and will do anything she can to get her back. She will take a big risk by leaving the cage, but that doesn't matter because the only thing that matters is finding her best friend. She gets distracted along the way, but she gets back on track and doesn't give up until she finds her. People should realize these things and maybe add them into their own lives a little bit. The biggest challenge our team faced was definitely trying to get together to film. Contacting each other and trying to find a day where we were all free was hard. It got a little confusing to see what we already filmed and what we still needed to film. Another challenge was definitely editing. It was hard scrolling through all the clips we had (we had a LOT) and trying to find which one we needed. We were trying to add it as many things as we could -sequencing, dialogue, etc.- but it would get a little frustrating when the shots didn't turn out as good as we hoped. Hello, it's me (see what I did there?). 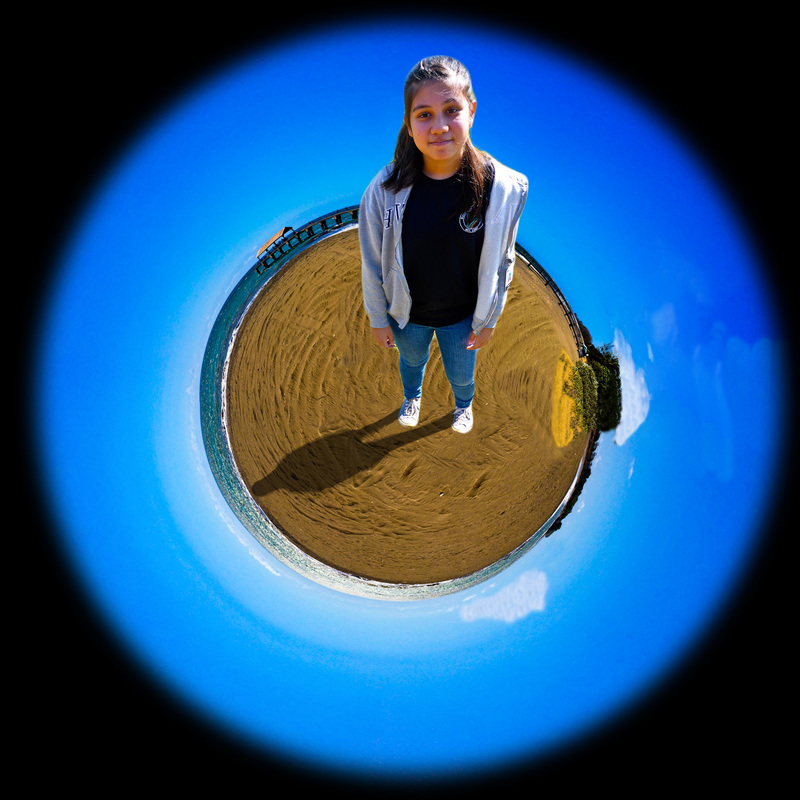 Right now in our Gifted and Talented class we are making Polar and Spherical Panoramas. When doing these, we need to make composite images, which is very important. It helps to see the things that you might've not seen with only one photo. 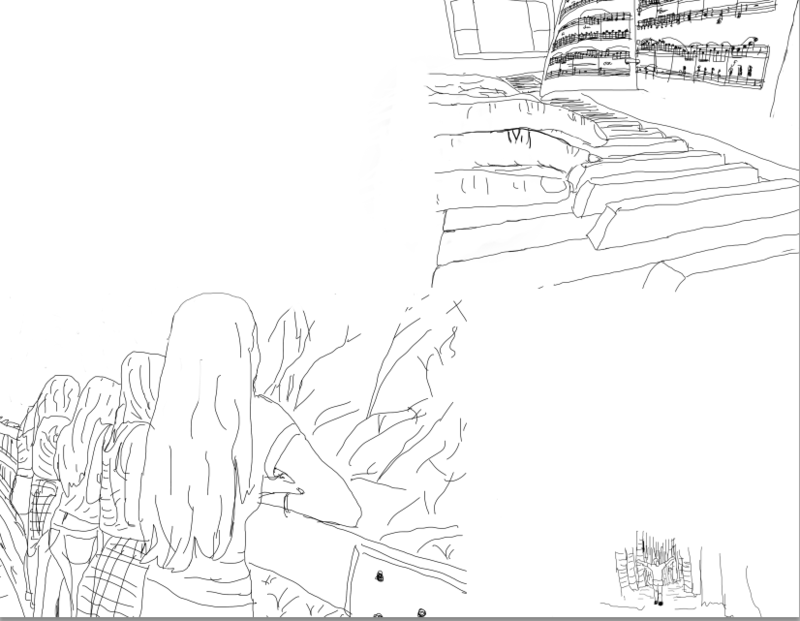 It adds more detail because the photos are overlapped. Photoshop combines them all to make it all connected as one panorama. 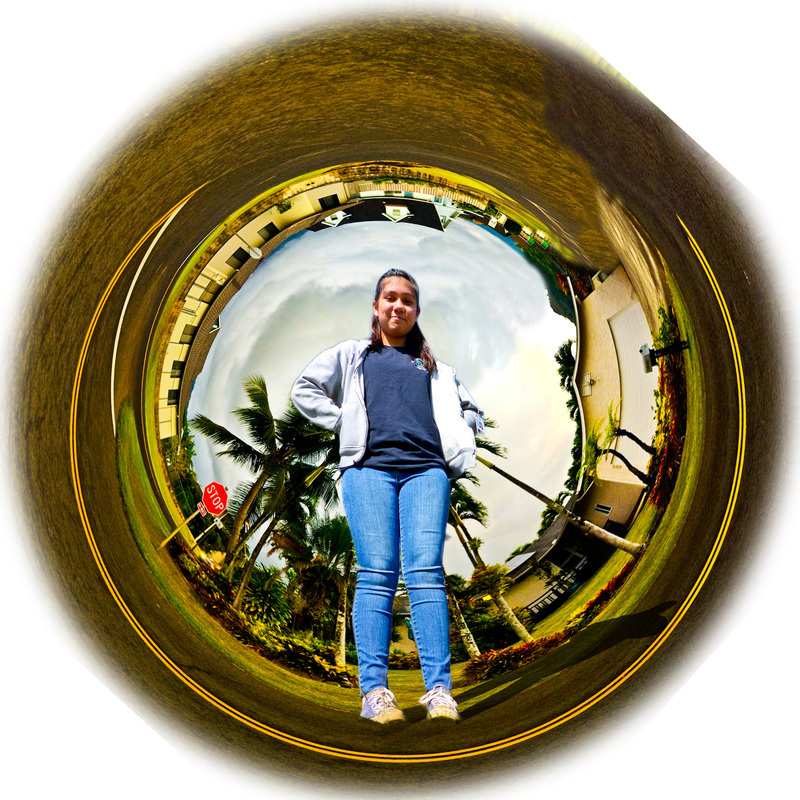 Many people think that polar and spherical panoramas are the same, but well, they're not. 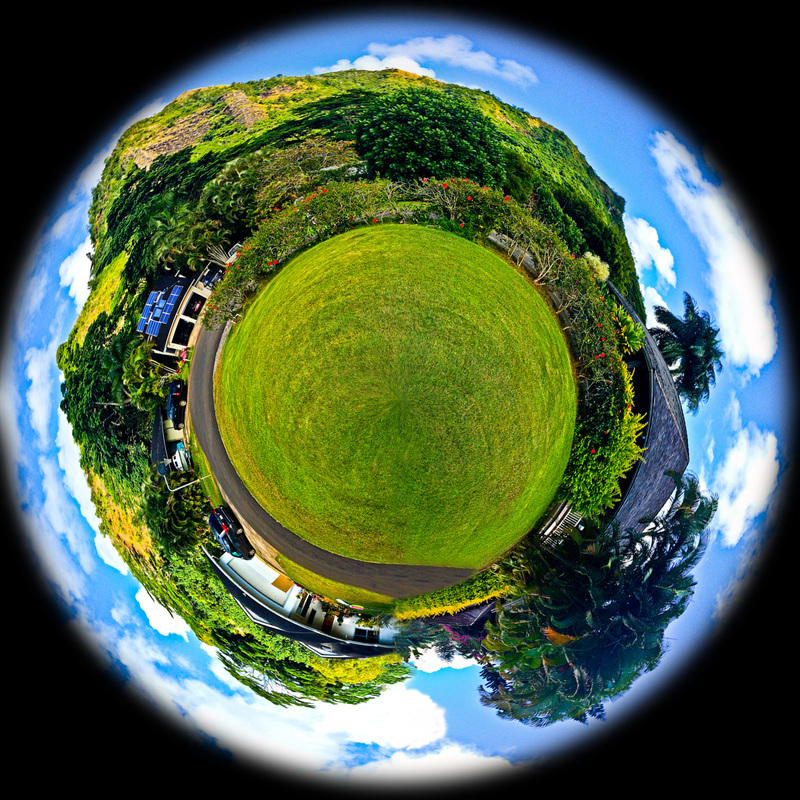 The difference between polar and spherical panoramas is that when you look at a polar panorama, It is like you are in space looking down on the world. 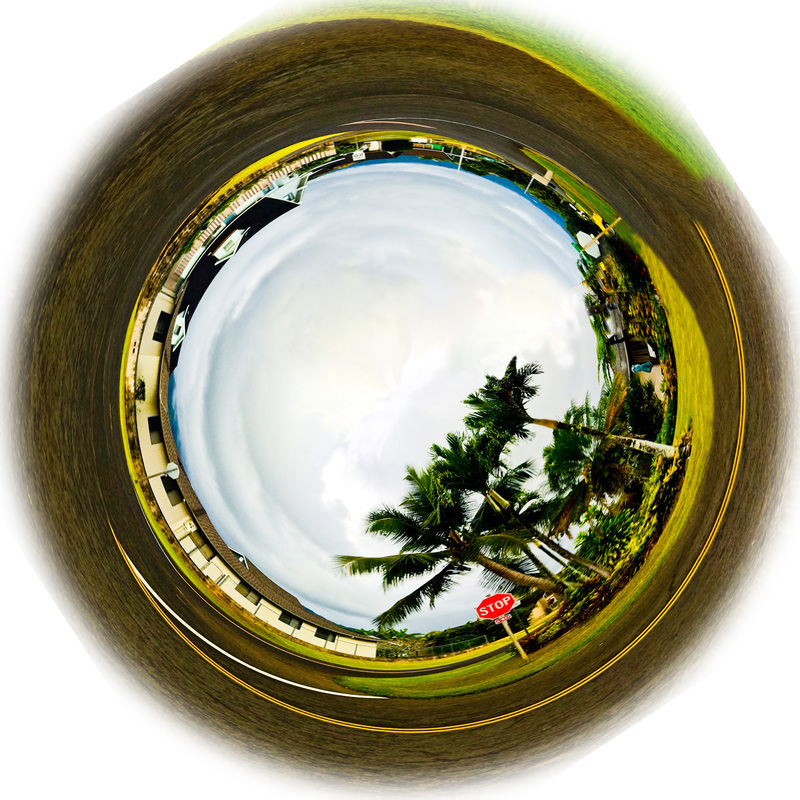 In a spherical panorama, it is as if you are on the ground looking up with the whole world around you. In a polar panorama, the land is in the middle and the sky is in the outside. In a spherical panorama, the sky is in the middle and the land is around the edges of the photo. What makes our tiny worlds look convincing is that in Adobe Photoshop we used the stamp tool to get rid of the line the shows where the sides meet. The stamp tool copies pieces from other parts of the picture and puts them in the place you want. It makes it look like it is one entire world that is all connected together. To also make it look convincing, we add effects in Adobe Bridge to make it look a little surreal.